Two models, each with two different gauge capabilities enable precision readings over a wide range of applications - from light to heavy duty loads. The standard system has a pull stroke of two inches with an option to extend to four inches. The longer pull stroke allows for complete extraction of most fixings in one simple operation. A load diffusion bridge and pyramid are available to keep reaction loads away from the anchor point. Shown on the photo, from left, is the Super Anchor Test System with Load Diffusion Bridge, and the Standard System with the Load Diffusion Pyramid. Two models are available, each with two different gauge capacities for precision readings over a wide range of loads and applications. A load diffusion bridge and pyramid are available to keep reaction loads away from the anchor point. Gauges have maximum load indicator and viscose damping protection against sudden load release. Long Pull Stroke for complete extraction and efficient operation. A variety of adaptors are available for different fixings. Compact mechanical design offers reliability and ease of use. Conforms to BS 5080:5973 and other international standards. Structural anchors for safety harness eyebolts. Safety anchors for ladder restraints. In order to test correctly and avoid damage to the host construction material, reaction loads must be absorbed by the structure well away from the fixing under test. This can be achieved by either a load diffusion bridge or, if greater distance is required,by a load diffusion pyramid. Both of these optional accessories have large feet to minimize bearing pressure and are height adjustable to accommodate different adaptors. Complete extraction of most fixings after test in one simple operation. When fixings are tested to failure, they usually need to be fully extracted from the base material. With plastic and other types of anchors, which fail by pulling from the base material, the extraction can be carried out without readjustment of the bridge legs. 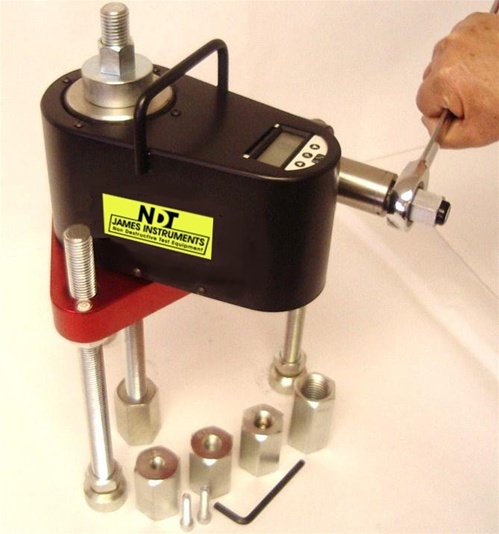 Faster set-up saves time on multiple testing projects.Initial adjustment of the height of the Tester relative to the fixing can be made with the loading handle rather than moving the bridge legs. Rubber casing for protection against shocks. Built-in protection against sudden load release. Sistema de anclaje estandar para medir la resistencia de anclajes en hormigon, madera, ladrillo y otros materiales de construccion.